Green building is the practice of increasing the efficiency with which buildings use resources – energy, water, and materials- while reducing building impacts on human health and the environment during the building’s lifecycle, through better sighting, design, construction, operation, maintenance and removal. Green products are made in ways, which reduce energy consumption, reduce resource consumption, leave a small footprint, last a significant length of time (reducing the need to have them replaced) and have no ill effects on you or the environment where they reside. Village Builders Inc. are constantly striving to stay ahead of the growing Green movement and have already shifted to using many green practices ahead of the construction industry norm. 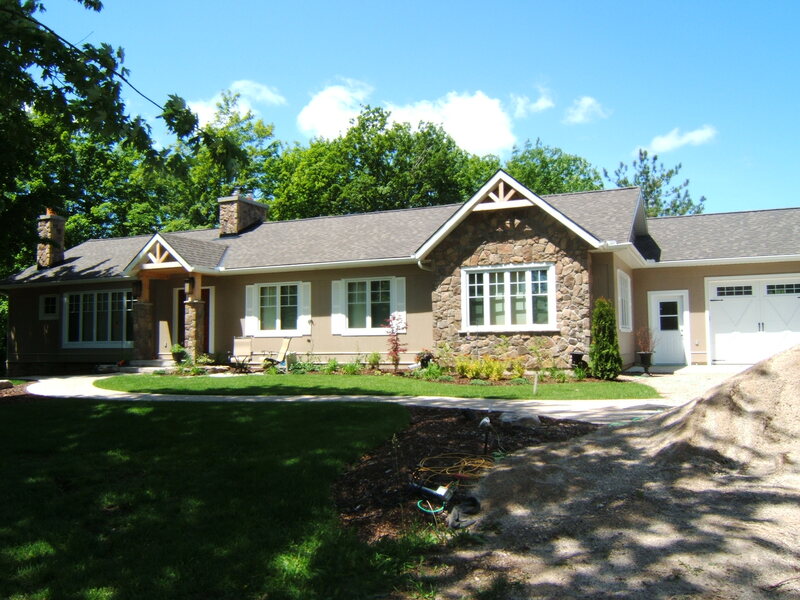 ICF is a wall system that takes the place of the conventional wood stick frame exterior wall. This product can be used for the whole home construction from the basement footings all the way up to the roof. The “R” value of the walls is R50. This reduces heating and cooling bills drastically. It also reduces noise and vibration from outside/or inside sources to almost none existent. Basements are always warm and dry, making them a more enjoyable space to live and use. Other benefits are fire resistance and design flexibility that cannot be achieved with conventional wood framing. The lifespan of this product will last the length and time in which you own your home. New spray foam is now made from non toxic, organic material, with no off gassing after installation. Spray foam gives you the most R value per inch and can be applied to many places that normal fibre glass insulation will not work. Also once an area has been properly foamed; it does not require a vapor barrier because the foam does not allow any air transfer. This eliminates problems such as air leakage or condensation issues in tight or inaccessible places. Windows are the number one source of heat loss in any home. The use of high quality windows ensures that minimal heat/cooling loss happens, keeping energy bills low and making every room in the home more enjoyable. High quality windows also have a significantly longer lifespan then cheaper windows in that there is no reason to replace them . Why heat your water all day and all night, burning energy, when you only use your hot water a couple of times a day. Tankless hot water is on demand hot water. So when you turn the tap to hot ,a flash boiler in the home super heats water and sends it to your tap. When the tap is turned off the flash boiler turns off. So you only heat water when you want and need it. Flash boilers are not large and hang on the wall, they can be installed anywhere and they replace the need for a bulky energy consuming hot water tank. Another benefit is that you will never run out of hot water. Imagine having warm feet all winter while you walk around your home. Radiant In-floor heat is plastic tubing installed below the finished floor of your home in a concrete slurry. The tubes are attached to a boiler that heats water and forces it through the tubes heating the concrete and in return radiating heat to your whole home from the floor up. Since heat rises, heat is always rising up and warming the home. The boilers are controlled by thermostats throughout the home, so that you can set different areas of the home to different temperatures. Since the concrete warms up and holds heat, your house will continue to stay warm even after the boiler has turned itself off. This reduces energy consumption and drastically reduces heating costs. A large benefit to this system is that you do not require a furnace in your home or the ducting and all of the equipment that hangs on the wall. The number one cost of your home in the winter and summer is your heating and cooling bills, regardless of what energy source you use. Geothermal is ground source heating. It is tubing placed underground on your property, or through your pond and it is filled with environmentally friendly gel that absorbs the natural warmth or cold that is stored down there all year round. The gel is circulated through the tubing by a pump and fed into the furnace where the air moving through it is warmed or cooled and circulated through the house. The one major benefit is that your energy bills are almost non-existent and those shrinking your energy consumption to the same. The ground is always warm in the winter and cool in the summer. The system only has to be installed five feet in the ground or at the bottom of a pond. This system can even be installed on a small lot or property by drilling small wells taking up less space. A great benefit to geothermal is that you can run the loops into a hot water tank, this preheats the water coming into your home so that the hot water tank only has to raise the tempature a small amount. The more air conditioning you use in the summer the more heat is pushed into the hot water tank, given you virtually free hot water. Every home built with Village Builders Inc. is fitted with a programmable thermostat. The thermostat controls the heating equipment for your home to keep it at the desired temperature. With a programmable thermostat you can set it to lower the temperature during the day when you are not at home. It will then raise the temperature automatically so that when you arrive home the house is at its desired temperature. This helps your energy consumption and keeps heating costs low. Everyone thinks of electrical wiring when they think of wiring. We install more structural wiring in a house then electrical wiring these days. Structural wiring can be run through your whole house, to every room. It can supply music to speakers in the house and can be programmed to play different music in every room, from different sources like radio, cd, satellite, cable or mp3 player. This system is fed from one source eliminating the need for multiple stereos in the home and gives you only one piece of equipment to update as your needs and technology changes. A major benefit for home owners is if you own a cottage, chalet or second home you can with an internet connection monitor your property from anywhere in the world when no one is home. This can give you piece of mind knowing that the sump pump has not failed or the heat in the house has not dropped to a dangerous level. Also with a security system you can find out who enters and exits your home, and how long they were there. You can also change the temperature on the programmable thermostat over the internet or from your cell phone. You can even turn lights on and off or program them to come on at a certain time. The energy savings alone will pay for itself over time. If you like the look of cedar shake roofs you will absolutely love this product. Enviroshake is an alternative to using cedar shake on your roof. They are installed like cedar shakes and over a short time they go silver just like cedar. They are made from 95% recycled materials (post industrial plastics, recycled rubber and cellulosic fibre materials)and are stamp with the same grain as wood cedar but they come with a 50 year warranty! This is a roof that you will only have to install on your home once in your lifetime. This product has a longer life span then the cedar that it replaces. Steel roofing has become a more common occurrence in residential construction because of the availability of colour and style. Also new building practices do not allow the sound of rain to penetrate through the roof. Steel roofing has a life time warranty and a paint warranty that is longer then most shingle warranties. Steel roofing also reflects the heat from the sun instead of absorbing it like asphalt shingles. This allows attic space to stay cooler making cooling of the house easier. No more repainting siding year after year, this product is siding that is made from concrete and is installed the same way. The color comes with a long warranty and it resists damage from bumping and scratching. Since it is made from concrete there is no nutritional value in it for animals or insects to feed on. Concrete siding looks like regular wood siding, comes in the same profiles and the same colours. The one place in your home that is attacked by all the elements, plus has to stand up to heavy traffic from people, animals, barbeques and even hot tubs is your deck. Composite decking is a product that looks like wood but is made from recycled paper and plastics. Most of these products come with a lifetime warranty and comes in a variety of widths, styles and colours. The deck will stand up for as long as you own the home. It saves having to replace the deck every 15 yrs like other decking types and it doesn’t splinter so that it’s safe for people in bare feet. There is nothing to rot in the material so hot tub water will not damage or stain it. The railing systems that come with them are so strong that they are almost unbreakable and are safe long after a normal wood railing has come to the end of its life. Forget manufactured flooring with all its chemicals. Reclaimed flooring and trim is the ultimate in Natural building product. The reclaimed flooring we use is all reclaimed from the barns and old houses in this area. Think of how unique your floor and trim will look with 100 year old Elm floors and 100 year Oak trim. Nothing has more character then a product that has seen a century go by. This kind of wood cannot be bought anymore; it just doesn’t exist in new wood. Since the wood has been reclaimed by Mennonite workers from local barns, this wood does not leave a large footprint. It is cleaned and cut square locally and saves on trees being cut down. Bamboo flooring has become a major green product that many would like installed in their custom homes. Bamboo is a grass plant that regenerates itself after harvesting. The shredded bamboo fibers and adhesives are compressed under extremely high pressure to form wood like planking. Please remember that not all bamboo flooring is free of toxic formaldehyde adhesives. You must be careful what you choose. Village Builders carry a formaldehyde free flooring. We can also get bamboo plywood urea-formaldehyde free including 1 1/2″ thick bamboo plywood that can be used for counter tops. Forest stewardship council accredits forest product companies that practice responsible forest management. These products are available in almost all wood flooring, lumber and plywoods. Villagebuilders works with a trim supplier that is FSC certified and a member of CaGBC. The wood trim can be traced back to managed forests were the trees came from. Insuring healthy forests for generations to come. They take all dust and wood chips left over from manufacturing of there products and heat pressurize them into wood pucks. They then sell these pucks to green houses as compost. They are a truly Green company. Paint has come a long way since the days when it contained lead. Now we use paint products that have a low VOC (which stands for Volatile Organic Compounds). This paint assures that your home will be safe for you and your family for years to come. It is also friendly to the environment. Water saving is the ever growing trend in plumbing fixtures. Two benefits to this, it’s easier on the environment and keeps your water bill lower. New faucets and shower heads have built in water saver technology without sacrificing performance or pressure. Most toilets sold in Canada are now low flow toilets, but now they have dual flush toilets. This allows the user to decide on how much water is needed per flush. Water filtration is has come a long way in the last couple of decades. With spin down filters you can remove sediment and carbon without need for chemicals. Also UV lights kill all bacteria and viruses in the water without having to resort to chemicals. Water softeners now come with the option of Potassium instead of salt. Potassium is much easy on the environment then salt and does a more efficient job. Softeners remove the hardness from your water, which is easy on all appliances and plumbing fixtures in the house. The other benefit is that softeners remove the chlorine from town water, improving the taste and quality of the water.